My pumpkin obsessed son already has me working on things for Halloween! Threads that Bind has a very cute pattern called Pumpkin Farm that makes five stuffed jack-o-lanterns. My son saw the pattern and insisted that I buy it. 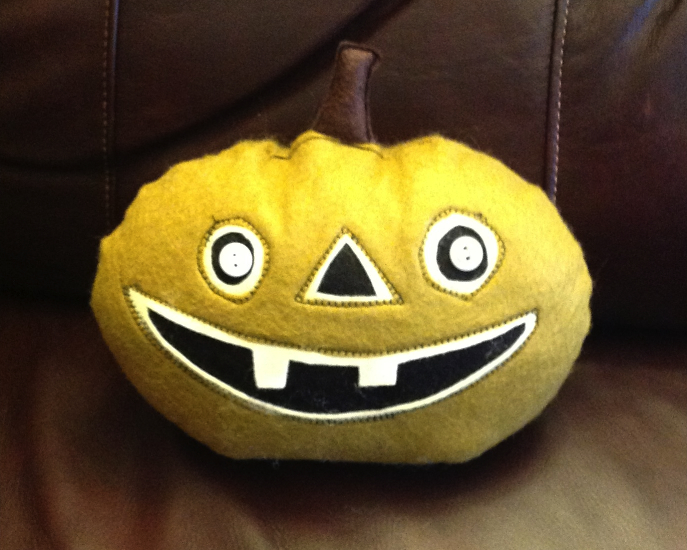 Now he is expecting me to make him one new pumpkin each day for the next week. “Crack” is the first pumpkin to be finished (although it will probably take a few more weeks to finish all five) and he turned out pretty cute. This is made with a very easy reverse applique process and only took about an hour to make. Since I know these pumpkins will get a lot of attention from my son (ie, he will eat, sleep, and play with them), I went ahead and used the cheaper wool felt blend for it. I don’t really care for this type of felt, it doesn’t look as nice and it pills quite easily. However, for a kid’s project, it’s just the ticket. This entry was posted in Dolls and Softies, For Kids, Holidays. Bookmark the permalink. Your son is a real task master. You will be proud to know that I am keeping up with the task you gave me of one square a week. love crack the pumpkin!!!! Well done! !